The craze for projector phones is anything but over. If you are following world cup closely then you might have come across a strange yet good advertisement for a Spice phone. Called as Spice Popkorn, this phone provides a project option of which there are multiple use cases as shown in the advertisement. The least of it is project a flower on a girl. All the other use cases are bound to make your life a living hell. But there are some very good uses of the phone. Ad folks have to be creative to get paid. You just don’t have to be that creative. 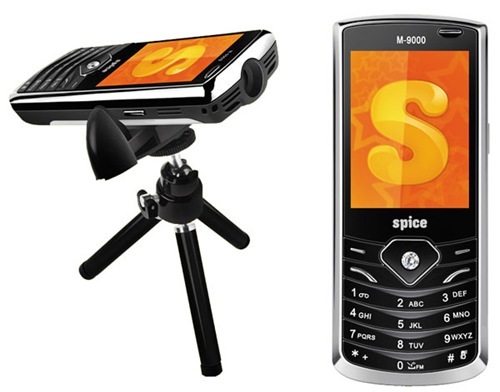 Spice M-9000 is a dual SIM phone with a in-built projector. It also comes with a analogous TV which will help you stream free-to-air channels, you know like the good old Doordarshan. There is a document viewer, in case you want to project a presentation on the side wall in the middle of a Christopher Nolan movie. Spice M-9000 aka Popkorn, has a 3.2 megapixel camera, FM with recording, Bluetooth, video player and a 6 cm QVGA screen. All of this comes at a measly price of Rs. 6999. There were two other projector phones launched. One by Intex and one by Techberry. Both the phones are priced in the 12K-16K range. At 7000 rupees, Popkorn is the cheapest projector phone out there and looks like real value for money. In case you need one to piss off your wife. Didn’t get the joke? Watch the ad. I like it but something missing. this latest mobile phone soungs great. plz plz do not buy this phone i have wasted 6300.